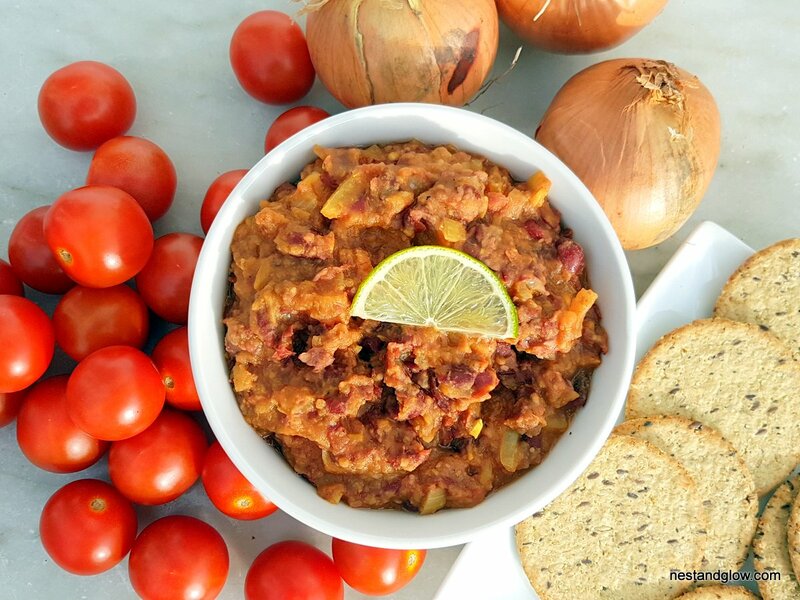 A Spicy Kidney Bean Tomato Dip that is cheap, nutritious and takes a few minutes to make. This dip is a staple in my diet as I always have all the ingredients on hand and it’s very budget friendly. 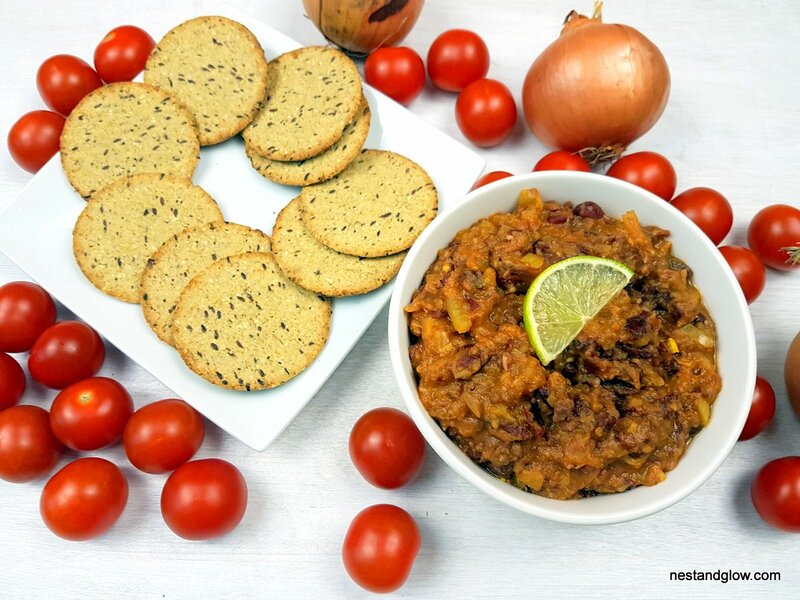 Serve with some oatcakes or carrot sticks for a filling meal or pop in a tub to have a healthy snack on the go. It doesn’t need any equipment other than a knife and something to mash with so ideal for making while you have limited kitchen facilities. The onion can be reduced by 80% and left raw if you are making without a kitchen. Add the onion, garlic and water to a pan and simmer for 4-5 mins until softened. Then add everything apart from the lime and chia and simmer for 2-3 mins. Mash the dip with a potato masher, just roughly to get a chunky but spreadable consistency. Add the lime juice, chia seeds then stir and serve. Tastes great either still warm or chilled from the fridge. I usually double the amount of turmeric and cayenne pepper as I like it spicy and try to eat as much turmeric as possible for its various health benefits. You can fry the onion in oil if you prefer but I try to not cook with oil for health reasons and it softens well just in water. It has a great mixture of crunnchy and smooth textures from the beans and chia seeds. I’ve made a non-cook version of this while somewhere with no kitchen and soaked the onion/garlic in lime juice or vinegar for an hour to make it soften and less acrid. Will last for a few days in an airtight container in the fridge. 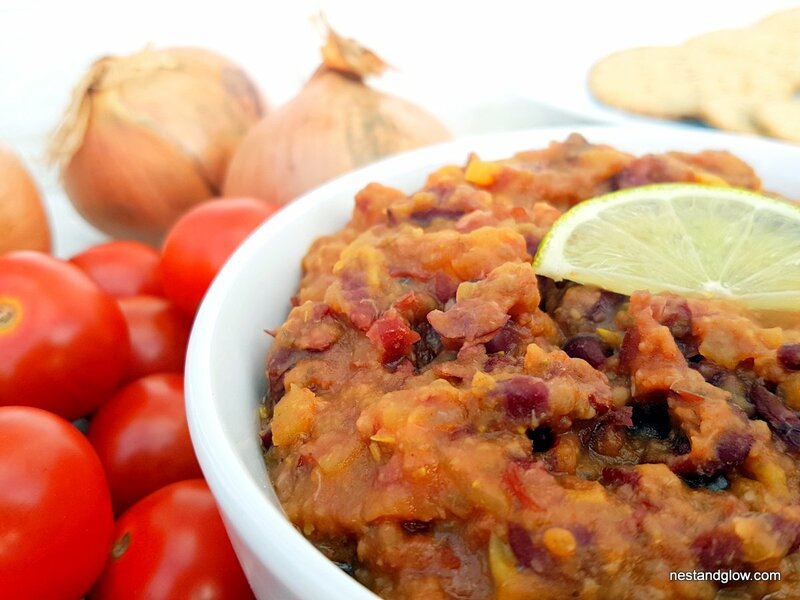 You can swap out the kidney beans for black beans/pinto or just about any other bean. Lemon juice works just as well as lime. If you don’t have chia seeds just skip adding any water after cooking and either add any seed (such as sesame, linseed) or leave out seeds altogether. Simmer the whole dish once the beans/tomato/etc is added helps to soften and break up the beans to make a smooth but chunky dip.